According to RT, Elon Musk of Paypal / SpaceX fame wants to put a colony on Mars. Musk’s proposed city will help re-settle 80,000 people, run on sustainable technology (at least in part), and contain a population of — you guessed it — vegetarians. I’m intrigued by this idea because it makes me wonder about the motives and possibilities of such a city. What would compel Musk to narrow his focus only to vegetarians (or people willing to convert)? What advantages would that provide a space-faring society? 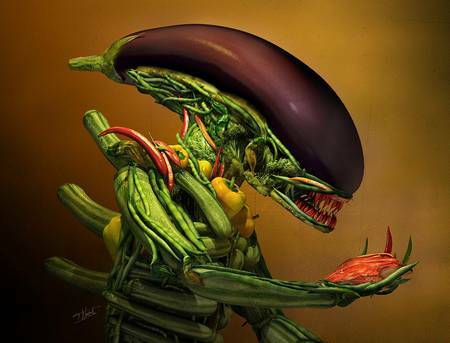 Salad alien only eats saladses. Meats is gross. But we don’t live in 1960. We live in 2012, and Musk intends to begin building said city as early as 2022. I’ll assume for the sake of argument that 2022 is a reasonable date for the foundations of a Martian city of vegetarians. But do the advantages remain? I’m not convinced. Considering that recent technological advances (such as those by the company, Modern Meadows) have opened up new possibilities for lab-grown meat, I think the argument in favor of a purely vegetarian colony is impractical. If we are able to produce such products now, imagine what another ten years of advances will do. Perhaps we’ll learn how to reproduce the animal cells from smaller colonies of cells (current technologies require us to get cells from an animal; I assume stem cell research opens up opportunities here, though I’m not a cell biologist). We already have growth stimulants for hospital patients, so it’s not beyond reason to assume we can do the same for lab-grown meat without creating an inferior product. This means that, in theory, we can reduce the required resources to maintain an omnivore culture. 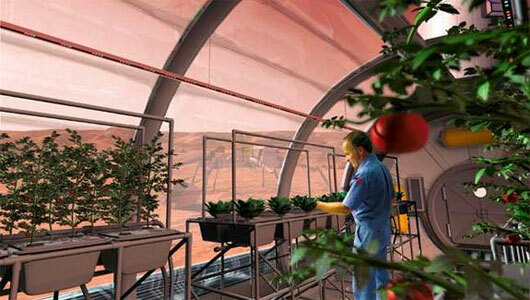 The only concern is one that already exists for any Martian colony — resources. To grow crops, lab-burgers, and so on, we need access to good soil, good nutrients, and so on. Presumably we can get that from Mars, but there’s another area in which I am not an expert. Apparently this is what vegan Mr. Rogers looks like…on Mars. What does everyone else think about this idea? “Science in Our Science Fiction” is a new feature on WISB. It will feature real science news and my thoughts about how it might apply in the future or might make for interesting SF stories, etc. ‹ Video Found: Neal Stephenson Chopping Fruit w/ Swords! Aliens: How Would Their Existence Effect You? Question: What happens when laser pistols are everywhere? Lab meat still seems a bit too bizarre and young a technology to put a lot of faith in. Vegetables bring a lot of good to Mars: ability to produce oxygen, almost infinitely renewable, and much more easily cultivated. With lab meat, you'd need a fairly complex biochemical setup to generate it, and a continuous supply of raw materials. I actually think this makes sense, and I am by no means a vegetarian or vege-sympathizer. Also, if you extrapolate this out, an entire planet with vegetarian tastes would be great for the long-term viability of creating a second Earth. Eventually, livestock would have to be introduced to a meat-consuming culture unless lab grown advances to a silly degree, especially in the area of what it can use as raw materials. You'd have to have crops on Mars for the city to sustain itself, but you also have to remember that a large crop field (which you'd need to feed 80,000 people) would take up an enormous amount of space. While it would help with oxygen production, it would not do much for Mars itself — the Martian atmosphere would require terraforming (currently beyond human ability, as far as I can tell) to sustain anything other than domed habitats. I'm not sure how this would work with the soil of Mars, but I assume one could use that soil for crop production. Point is that while crops offer a lot of benefits, they also present different dangers, such as a larger surface area to heat, a larger target for micrometeors, etc. Lab-grown meat, in theory, could derive many of its resources from the soil of Mars and from bio-waste, among other places. No matter what you do, you have to have crops of some kind. That said, if we can produce meat in a lab, it follows that we might find a way to do the same for veggies (how does photosynthesis play into this?). But since we're talking extrapolation, perhaps technology will produce a non-animal-based "meat" product that is essentially pure nutrients. We'll call it Gruel X.